3-wire twistlock Female Connector, 30 Amps @ 125V. NEMA Config L5-30. 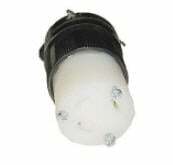 Connects to transfer switch models 30116V, 300660, TS300130, 300130, R300130 and power inlet box model 53002. UL Listed.